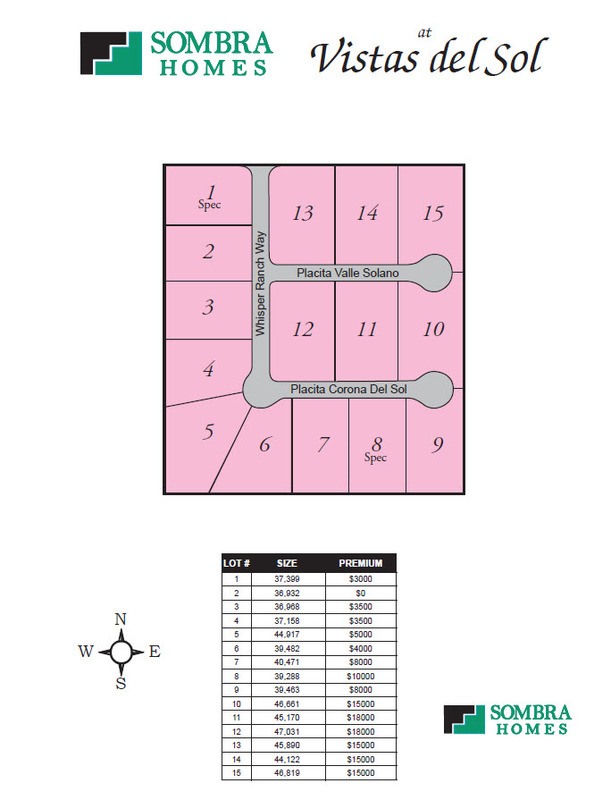 Located in Vail at the corner of Camino Loma Alta and Garrigan's Gulch, Sombra Homes newest subdivision, Vistas del Sol, will offer 9 spacious, single-story floor plans to choose from, ranging from 2285 sq. ft. to 3720 sq. ft. in Contemporary Southwest style designs. These elegant homes feature split floor plans, 3-5 bedrooms, 2-3 baths, finished 3-car garages, covered patios, front yard landscaping, walled-in back yards, plus a multitude of standard luxury features including granite kitchen countertops, Stainless Steel GE appliance package, fireplace, ceiling fan in all bedrooms/dens plus one living area, extensive ceramic tile, game room and wet bar in certain models, and so much more! Vistas del Sol offers magnificent views of Rincon Mountains along with A+++ Vail School District. Within 30 minutes of major employers including Raytheon, University of Arizona and Downtown, this is the perfect location to build your dream home! Please contact our Sales Agent, Leslie Gladu, (520) 488-0146, or by email to leslie@sombrahomes.com, for further information. Move-in Ready in February 2019! Ready for occupancy in March 2019!